Just read this news from MX Newspaper. Sad, heroic, indescribable when parents love their children so much. Three parents drowned trying to rescure their two children on an extended family holiday.The two boys, cousins aged 8 and 6, survived. They were playing near the edge of Canada’s Wapishish River when they feel in and godt caught in a current at a rural chalet near Saint-Fulgence, 200km from Quebec City. 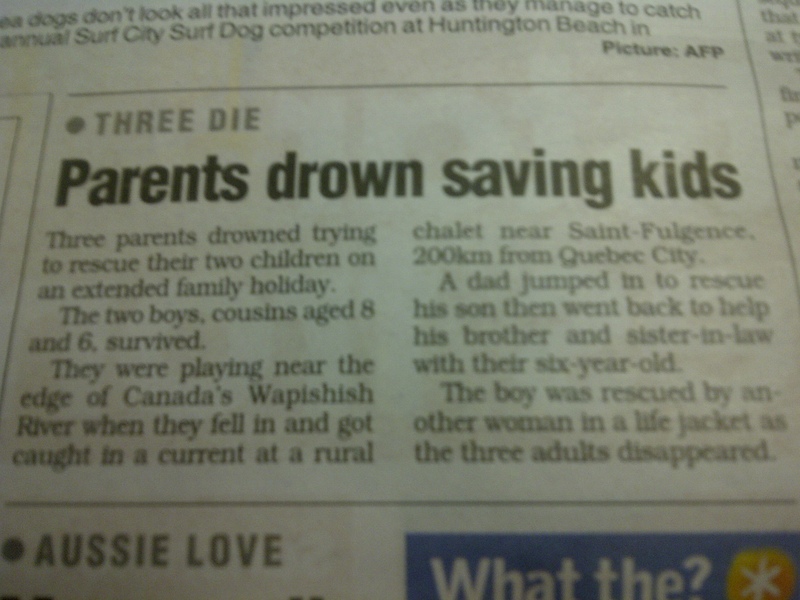 A dad jumped in to rescue his son then went back to help his brother and sister-in-law with their six-year-old. The boy was rescued by another woman in a life jacket as the three adults disappeared.